Make disciples and help change the world! Since 2009, millions of children around the world have learnt what it means to faithfully follow Jesus Christ through The Greatest Journey discipleship program, which follows the distribution of Operation Christmas Child shoeboxes by Samaritan's Purse. As a result, lives are being changed for eternity and new churches are springing up in communities across the globe. We praise the Lord for making The Greatest Journey one of the largest discipleship programs in the world today. Up to now, it has been available in developing nations only but a new edition, created by the Billy Graham Evangelistic Association and specially aimed at children in the developed world is now available in Australia and New Zealand. One pack for 10 students consists of 10 copies of Student Books 1, 2 and 3, 1 copy of the Teacher’s Guide and 25 copies of our Steps to Peace with God tracts. The Teacher’s Guide is an excellent resource to prepare any Sunday school or Scripture teacher to deliver an interesting lesson that will keep the students engaged. From Australia and New Zealand, Samaritan's Purse services four developing nations with The Greatest Journey program and in those nations, by God’s grace, over 20,000 children enrolled in The Greatest Journey in the previous season. In 2015, Samaritan's Purse is hoping to enrol over 40,000 children and is prayerfully working towards increasing the number of new children discipled every year in our region to 150,000 within 3 years. Globally, Samaritan’s Purse through Operation Christmas Child is planning on discipling over 2 million kids in 2015 and this number will, God willing, increase substantially over the next few years. Our prayer is that Australian and New Zealand children will not be left behind in this massive worldwide discipleship program. We appeal to churches and Christian schools in Australia and New Zealand to reach out to the children entrusted to them by God, by taking them on this greatest journey of all, which will help them to grow up to be the young men and women that God created them to be. When ordering these materials on our website, please consider making a small donation to help disciple a child in the developing world. The Greatest Problem – This lesson teaches that there are consequences for our sin, we are loved by God despite our sin, and He has planned a way to take away our sin. The Great Creator – This lesson teaches that God made everything good and He made people to know Him and follow Him. He loves us and we are not a mistake. The Great Saviour – This lesson teaches that Jesus was fully God and came to Earth fully human, living a sinless life. Jesus is our Saviour and the only way to fix our sin problem. The Greatest Friend – This lesson teaches that the problem of sin has been solved once and for all by Jesus and we can now be in a right relationship with God. The Great Change – This lesson teaches that God will help us change our lives when we become followers of Jesus. 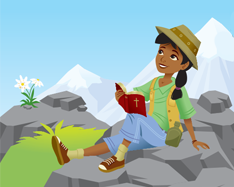 The Greatest Blessing – This lesson teaches that children are important to Jesus and don’t have to wait until they’re grown up to experience God’s presence, power and purpose in their lives. The Greatest Trust – This lesson teaches that we can trust God even when difficult things happen. God will fill us with His Spirit of wisdom and power to do the right thing. The Greatest Partnership – This lesson teaches that God wants to use us to be a blessing to others; He can take the little we have and turn it into more than enough. 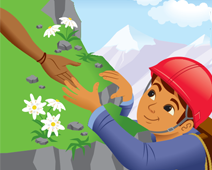 The Greatest Help – This lesson teaches that Jesus has the power to heal the sick and forgive sins. God can use us to help our friends meet Jesus. The Greatest Love – This lesson teaches that God loves and cares for everyone and we are to love and care for others, even our enemies. We show Jesus’ love in our words and actions. The Greatest Hope – This lesson teaches that heaven is a real and perfect place and following Jesus is the only way to get to heaven. The Greatest Mission – This lesson teaches that our greatest mission is to tell others the Good News of Jesus Christ; the Holy Spirit helps, guides and empowers us to do this.